U.S. stocks gained Thursday, with the Dow up more than 100 points, as investors continued to analyze the flow of corporate earnings and a series of conflicting economic reports, but sentiment was brightened by strong market debuts from Pinterest Inc. and Zoom Video Communications Inc. The Dow Jones Industrial Average DJIA, +0.42% rose 142 points, or 0.5%, to 26,592 and the S&P 500 index SPX, +0.16% added 7 points, or 0.3%, to 2,907. The Nasdaq Composite Index COMP, +0.02% meanwhile, reversed its earlier drop to advance 5 points to 8,001. Stocks are poised to finish the week on a positive note, with markets scheduled to be closed for the Good Friday holiday. The S&P 500 was on track for a flat week but the Dow was set to rise 0.7% and the Nasdaq was on pace to finish 0.2% higher. Investors were deluged with a series of new earnings reports and data that sent inconsistent messages about the health of the U.S. and global economies. The first-quarter earnings outlook has improved somewhat, according to CFRA, which said consensus estimates now call for a 2.3% fall in first-quarter operating earnings a share. That is up from the call for a 3% drop ahead of the kickoff of earnings season, but down from the 4.5% increase projected at the end of last year. Meanwhile, second-quarter earnings are now forecast to eke out a 0.3% advance, CFRA said, which would avert an earnings recession — commonly defined as consecutive quarters of falling profit. Retail sales data showed a rise of 1.6% in March, beating consensus estimates. The increase was driven by a 3.5% rise in auto sales, but even with autos and gas stripped out, sales rose by 0.9%, after February’s 0.4% decline. IHS Markit said its U.S. composite PMI — a survey-based measure of activity in the manufacturing and services sectors — fell to 52.9 in April from 55.3 in March, a 31-month low. Analysts noted that market participants have largely ignored headlines surrounding the Russia investigation and other political turmoil, but some see scope for a negative reaction if the report ultimately appears to be less exculpatory of President Donald Trump and his campaign than characterized by Barr. New applications for unemployment benefits fell for the fifth week in a row to a near 50-year low of 192,000, below economists expectations of 204,000, per a MarketWatch poll. The Philadelphia Fed’s regional manufacturing index, meanwhile, fell to a three-year low of 8.5, below economists expectations of 11. U.S. business inventories rose 0.3% in February, according to the Commerce Department. The ratio of inventories to sales remained unchanged at 1.39, indicating the number of months it would take to sell inventory on hand. The Conference Board’s Index of Leading Economic Indicators rose 0.4% in March, indicating a slight uptick in U.S. economic activity from a weak start to 2019. The market took the release of Special Counsel Robert Mueller’s report on his investigation into Russian election interference in stride. The Justice Department provided the Mueller report to Congress and the public Thursday morning. Portions of the report are be blacked out. “A lot of good news has already been priced in to the market, and investors are still in search of the next catalyst to drive stocks higher,” said Michael Arone, chief investment strategist at State Street Global Advisors. “Investors are still fearful of a global economic slowdown,” and want to see a rebound in Europe and more confirmation that China’s economy has bottomed, before markets can take the next leg higher, he added. “There’s been a lot of turbulence in retail recently so it’s good to see [retail sales data] blow it out of water, and we can likely thank the tight labor market boosting consumer spending,” said Mike Loewengart, v.p. of investment strategy at E-Trade Financial Corp., in an email. “The recent uptick in wages and the possibility that we’re in a sweet spot with inflation could also continue to drive momentum,” he added. 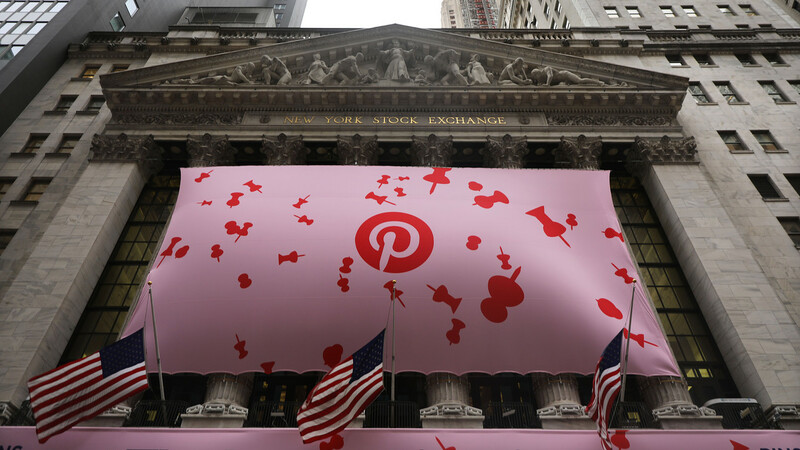 Pinterest PINS, +28.68% soared 30% on its debut in the market after pricing its initial public offering higher than expected, raising more than $1.4 billion and valuing the company at more than $12 billion. Zoom Video Communications ZM, +73.39% which reportedly priced its IPO above its stated range as well, surged 75%. Shares of Philip Morris International Inc. PM, -1.17% dropped 0.9% after the tobacco company beat expectations for first-quarter earnings and revenue, though issued downbeat guidance. Travelers Cos. TRV, +2.27% shares gained 2.9% after the insurer beat estimates for first-quarter sales and earnings, while raising its quarterly dividend. Shares of American Express Co. AXP, +1.72% rose 1.8% after the global payments and credit card company reported a first-quarter adjusted profit that topped expectations, but revenue that came up shy. Shares of Alcoa Corp. AA, -3.82% fell 4.3% after the alumina and aluminum producer late Wednesday reported a wider-than-expected loss for the first quarter, while also falling short of sales expectations. Atlassian Corp. TEAM, -8.32% shares sank 8.6% after the software company issued its earnings outlook which fell short of expectations. Shares of Honeywell International Inc. HON, +3.78% rose 3.7% after the aerospace, building technologies and materials company reported first-quarter earnings and sales that beat expectations, and raised its full-year outlook. Stocks in Asia closed on a down note, after Japan’s Nikkei NIK, -0.84% lost 0.8%, while Hong Kong’s Hang Seng Index HSI, -0.54% fell 0.5% and China’s Shanghai Composite Index SHCOMP, -0.40% retreated 0.4%. European stocks were trading modestly higher, with the Stoxx Europe 600 SXXP, +0.22% rising 0.2%. In commodities markets, crude oil CLK9, +0.36% shook off earlier weakness to rise and gold prices GCM9, +0.00% settled mostly unchanged. The U.S. dollar DXY, +0.45% meanwhile, gained value relative to its peers. The health-care ETF slid another 0.2% after falling 3% on Wednesday. It is now down 1% for the year, while the S&P 500 SPX, +0.16% has notched gains of around 16%. Pfizer Inc. PFE, -1.25% , Johnson & Johnson JNJ, -0.72% , Merck & Co. Inc. MRK, -0.99% and Walgreens Boots Alliance Inc. WBA, -0.92% were among the Dow Jones Industrial Average’s DJIA, +0.42% top five losers. Biopharma companies enjoyed a relatively strong start to the year, but shares have slumped since. The iShares Nasdaq Biotechnology ETF IBB, -0.57% fell 1% on Thursday, and although the sector is up 8% for the year, it is still trailing the S&P 500 by 8 percentage points. The SPDR S&P Pharmaceuticals ETF XPH, +0.03% , up 6% for the year, is lagging the S&P 500 by almost 10 percentage points. Stocks were mostly higher Thursday on robust industrial company gains, two strong initial public offerings (IPO) of tech companies and improved retail sales in March. Offsetting those positive developments were weakness in the health care sector and a manufacturing report from Europe’s largest economy that missed analyst expectations. Industrial stocks led gainers, with Snap-on, which makes hand tools, and United Rentals among shares posting increases. Both companies posted stronger-than-expected earnings in the recently completed quarter. Two highly anticipated IPOs boosted investor sentiment. Videoconferencing firm Zoom, which has turned a profit, began trading at roughly 70 percent over its offer price, and social media platform Pinterest, which has not yet posted a profit, began trading at more than 20 percent of its offer price. The Commerce Department said U.S. retail sales rose 1.6 percent at the fastest pace since September 2017. For example, sales at gas stations rose 3.5 percent last month, auto sales climbed 3.1 percent and apparel sales were up 2 percent. Health care stocks struggled. Pfizer and Centene paced decliners. Earlier this week, UnitedHealth’s CEO said that Democratic Party proposals like Medicare for All could destabilize the nation’s health care system and hit insurance company profits. A purchasing managers index from Germany edged up but remained in negative territory and was lower than expected. Has Boeing Stock Finally Bottomed? Comments Off on Has Boeing Stock Finally Bottomed? Aircraft manufacturing company Boeing (NYSE:) has been in the news in recent months, but not for good reasons. The commonly used Boeing 737 Max 8 has been a popular plane among airlines since it first arrived on the market a couple of years ago. With more than 4,000 planes ordered within the first 6 months, the model sold very quickly due to its fuel efficiencies compared to older models. The 200 seat plane also has relatively quiet cabins, and a good amount of legroom which passengers can appreciate as well. In case of bipartisanship, politicians from both major parties have criticized stock buybacks this years. Even with that criticism, companies aren’t shying away from buying back their own shares and some exchange traded funds dedicated to that strategy are thriving. The SPDR S&P 500 Buyback ETF (NYSE: SPYB) is handling the controversy swirling share repurchase programs with aplomb. That ETF is up 18.63 percent year to date, an advantage of more than 250 basis points over S&P 500-tracking ETFs. SPYB, which debuted over four years ago, follows the S&P 500 Buyback Index. Buyback levels have been soaring in recent years, but are historically more volatile than dividend payments. Some sectors are home to more dedicated buyers of their own shares than others and SPYB and rival buyback ETFs often reflect sector-level share repurchase trends. Home to 100 stocks, SPYB allocates almost 45 percent of its combined weight to the financial services and technology sectors. Consumer discretionary and industrial names combine for 28.48 percent of SPYB’s weight. On a percentage basis, the increase in share repurchases among S&P 500 member firms over the past 20 years has been staggering.